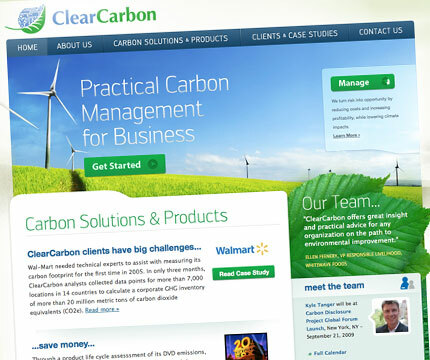 We are proud to announce the launch of ClearCarbon's newly redesigned web site. ClearCarbon is a full service carbon specialty consulting firm, working to find increases in efficiency while reducing greenhouse gas emissions. As a young company, they've seen great success since their launch in 2007, helping businesses like Wal-Mart, Fox, and White Wave save millions of dollars. ClearCarbon's most important asset is their client list. Going into the project, we knew we needed a site that could keep up with their flood of new case studies and logos. We also needed to tie this work to deeper content on the site such as service descriptions, presentations, and staff specialists. ExpressionEngine is a perfect fit for these requirements - it allows ClearCarbon to easily manage unique content types and create clear relationships between them. For an example of these relationships, check out a staff page or browse some case studies. We also worked on a brand update for ClearCarbon, keeping their colors and fresh look. The new logomark brings industry and nature together, expressing ClearCarbon's commitment to profitable, practical solutions for greenhouse gas reduction. It was unveiled on the new site last week, and each segment of the logo will be broken out and re-used as graphics in ClearCarbon's presentations and documents. The final site design showcases ClearCarbon's wealth of expertise with a clean, inviting design. The homepage was built to give ClearCarbon the maximum control over their content, while still feeling balanced and rich. We enjoyed working with the ClearCarbon team to create a web presence that reflects the firm's reputation as a leader in a cutting-edge industry.